Hi, I am interested in your 1969 Chevrolet Corvette (stock #1271-TPA) listed on Autotrader for $45,995. I'd like to get more information about this vehicle and confirm its availability. 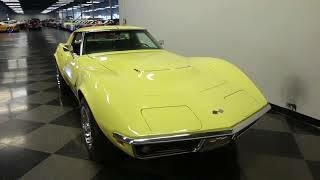 Numbers-matching 427 big block, triple-deuce carbs, and a bold factory-correct Daytona Yellow yes, this 1969 Chevrolet Corvette Stingray is everything you want in a fast and distinguished vintage Vette. And it even has the documentation to prove it! Daytona Yellow is a great color to have on a big block Vette. Its a rare color offered for only a couple of years, and its name alone instantly reminds you of the Corvettes victories on the racetrack. There has been a solid investment in the shine of this paintwork. So it brightly highlights the crisp lines of the big block hood, flying buttress rear, and large fender flares. And speaking of shine, the early C3 cars are the ones to own because of all the great brightwork. On a properly presented 69 that means mirror-like chrome bumpers, bright rocker panels, and shining side inserts so this Stingray truly has gills. You even have the luggage rack to remind you this is a premium grand touring machine. Top it off with a correct Rally wheel package with correct Goodyear Polyglas tires, and this is exactly the kind of standout presentation you want on such a distinct coupe. The factory-correct green interior is a great complement to the yellow on the outside. So this one is a distinctive total package. Not only does this green really represent the era nicely, but also it allows the silver accents to pop on everything from the door panels to the three-spoke steering wheel. For the driver, the dual pod gauges are in front of you with a full auxiliary readout package prominently to the side. It has all the right factory options, like power windows, a tilt column, and an AM/FM stereo. But the features we know youll like the best are the T-tops and removable rear window. Not only does it provide a convertible-like experience, but also it allows you the to listen to the roar of the engine singing behind you. Under the hood is the cars original L68 427 cubic inch V8. Yes, this a numbers-matching big block, and its a true tri-power monster with the correct LN suffix code on the block. The engine bay is nicely dressed with a correct triangular air cleaner and chrome valve covers over a Chevy orange engine block. More than just look good, this fires up straight away and the dual exhaust lets loose a ferocious roar. The three-speed automatic transmission was built to handle the monster power and torque this big block brings to the streets. Plus, with the fully independent suspension, limited-slip rear end, power steering, and four-wheel disc brakes, this is a beastly Corvette thats easy to tame. The sale comes complete with the right documentation, including the original Protect-o-Plate warranty card, owners manual, and reproduction window sticker. So you have a beautifully presented coupe with all the right documentation for a true classic. And even better, its also a huge power machine youll love driving. That level of appeal never stays around long, so dont miss out. Call today!! !